Now that the umbrella of "protection" by corrupt officials and law enforcement evaporated once President Trump took office many unscrupulous officials, judges, attorneys, cops, etc. will be investigated and prosecuted . Peter Zanoni is once such dishonest, unethical, corrupt person. Corrupt City of San Antonio, Texas officials / employees have since 1982 secretly , illegally dumped invoices, bills, fake statements , altered documents, etc. into an internal telephone billing account - the “telephone variable” and used the City’s Avaya Telephone Contract to fraudulently bill individual city departments, state/federal agencies and others for “ghost” expenses. Attorney Malinda Gaul , Bexar County TX 57th District Judge Antonia Arteaga, attorney Deborah Klein, attorney Mark Kosanovich, attorney Michael Bernard ( brother of White House Social Secretary Jeremy Bernard) , City IT Director Hugh Miller, City CIO Richard Varn , Deputy City Manager Peter Zanoni, Texas Ranger Hank Whitman and others conspired to finance a “Fraud upon our Court” with tax dollars and to conceal reams of critical evidence in an effort to cover-up decades of criminal activity and public / police corruption . They presented a well-rehearsed fabrication to the Court while they hid material evidence directly contradicting false testimony offered under oath including CIO Varn’s deposition, Administrative Directive 6.12, a search warrant for the bank records of City IT Manager Jose Medina, documents showing how Medina and city vendor Isabel Gonzaba ( IG Communications) stole upwards of $200,000 via the City’s Avaya contract, decades of state/federal grant fraud via the internal billing account - “ the variable” , decades of “cooked” books, aggravated perjury , falsification of government documents and other crimes. While Gaul helped defraud our Judicial System and conceal the criminal conspiracy her husband Alamo Area Council of Governments -AACOG Director Grant Gaul - helped conceal the illegal activity inside AACOG with the assistance of Director Dean Danos, Director Mike Quinn, City Municipal Integrity Manager Virginia Quinn ( Mike's spouse) , Bexar County Commissioner Kevin Wolff and others. 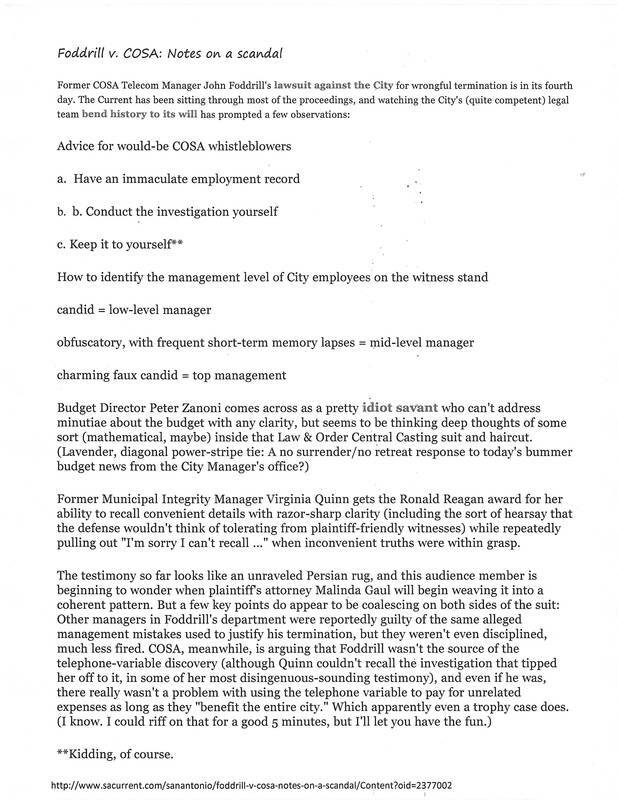 SA Current Editor Elaine Wolff believed that Zanoni came across as an idiot savant when he testified under oath in Court while helping conceal three decades of fraud/theft involving tens of millions of dollars .....Municipal Integrity Manager Virginia Quinn is noted for having selective amnesia while spouting lies about the Telecommunications Manager.